So I recently hosted bunko at my house. I’m in a Bunko group with eleven other ladies, we all take turns and host a different month. The hostess makes an entree and a few other dishes and the other ladies each bring a dish to share. My friend, Kim, brought a candy bar cookie pie…two actually. One made with sugar cookie dough and one made with chocolate chip cookie dough. I asked her how she made it, she said she saw a video on facebook…it’s so funny because a couple of days later, I saw the video show up in my news feed. 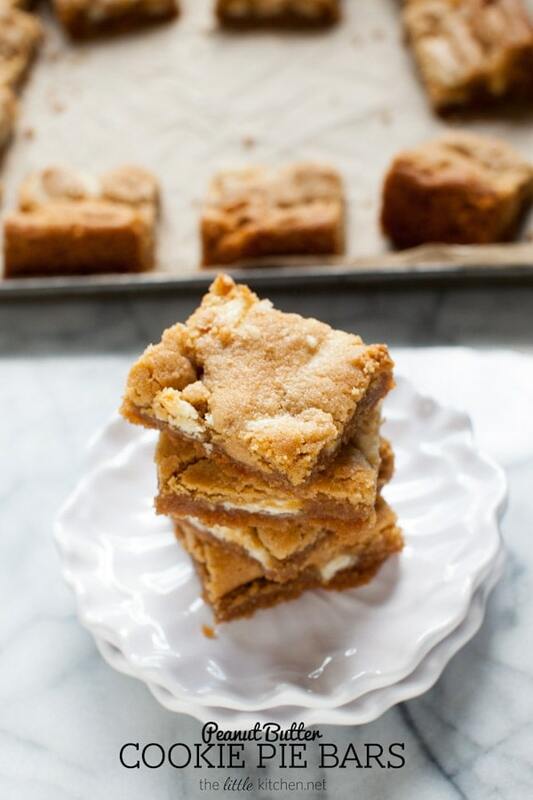 She used store-bought ingredients and I decided to use what I have — for the candy bars, I had white chocolate peanut butter cups that I bought and had grand plans for…ok, not really, I wasn’t sure what I was going to make until this idea popped into my head! 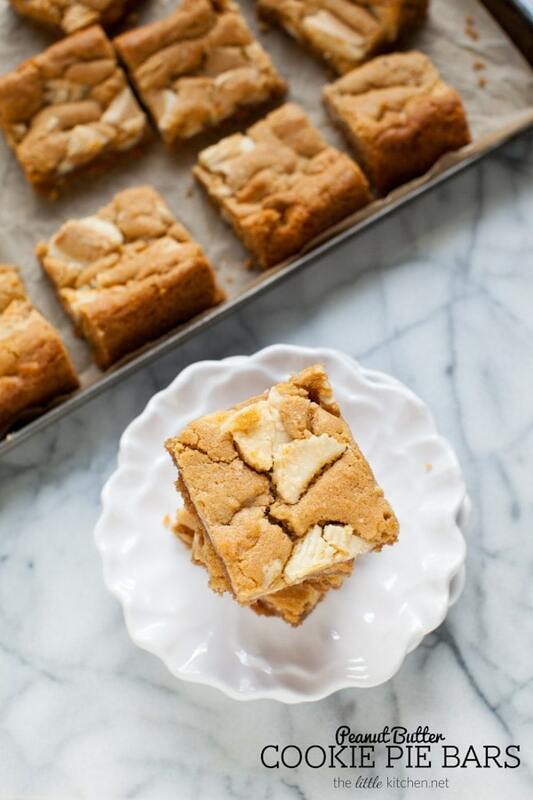 I also LOVE Elise’s peanut butter cookie recipe and that’s the cookie dough I used for these pie bars…and used a square pan to make them pie bars. I just love when a plan comes together so smoothly! 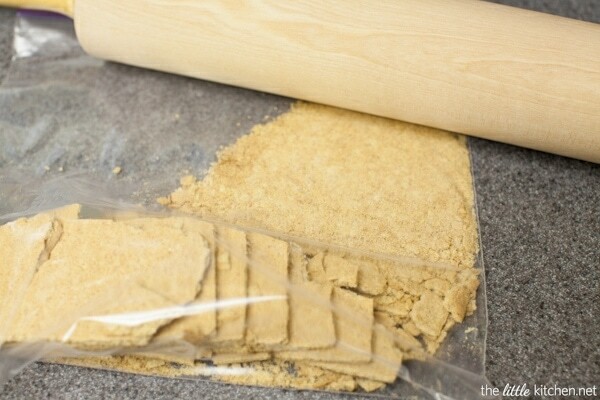 This is how I make the graham cracker crust by crushing graham crackers with a rolling pin. And then mix in ground cinnamon and powdered sugar and then 10 tablespoons of butter. I know it’s a lot…I actually used the same basic crust from this cheesecake recipe but I wasn’t really thinking and put in 10 tablespoons of butter to melt. It resulted in a more wet crust (hard to describe) and I LOVED IT. Place in a prepped square pan and refrigerate for at least an hour. 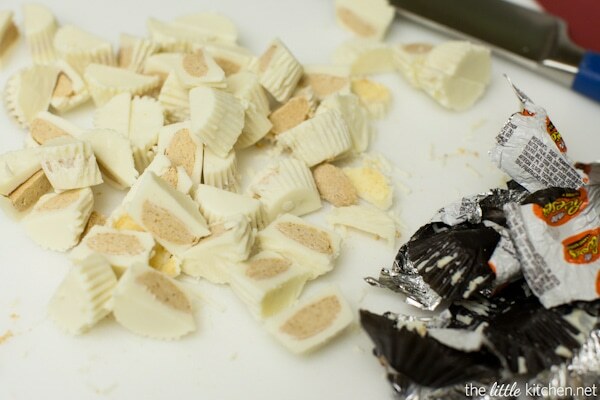 Cut up the white chocolate peanut butter cups! 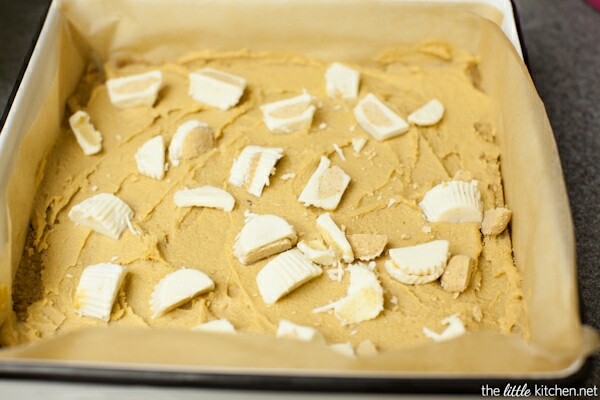 And then make the peanut butter cookie dough. Spread half of the cookie dough over the crust. And add half of the peanut butter cups and push them into the crust. Then repeat with the rest of the cookie dough and butter cups. These are so good…I’m obsessed with them. Yes, I become easily obsessed but that’s what happens. Next time, I’m trying them with chocolate peanut butter cups! Yeah! 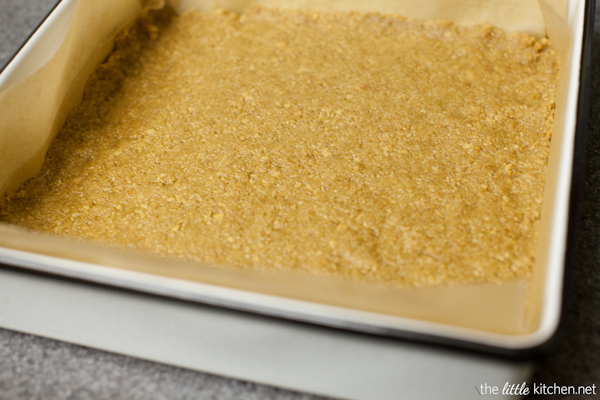 Line a 9-inch square pan with with two pieces of parchment paper going opposite ways so you’re creating a sling. Set aside. 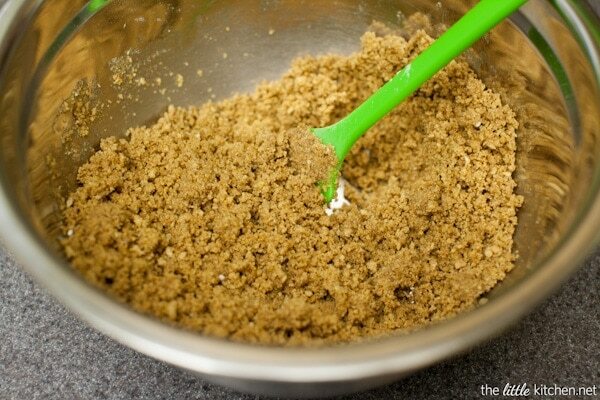 In a small mixing bowl, mix together graham cracker crumbs (I put graham crackers into a zippered plastic bag and use a rolling pin to make them into crumbs), ground cinnamon and powdered sugar. Add melted butter and mix thoroughly. 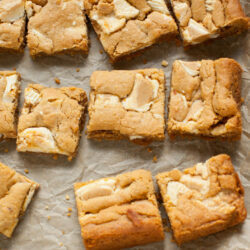 Add crust to the lined square pan and push down with your fingers, as evenly as possible creating a crust. Cover with plastic and refrigerate for an hour. 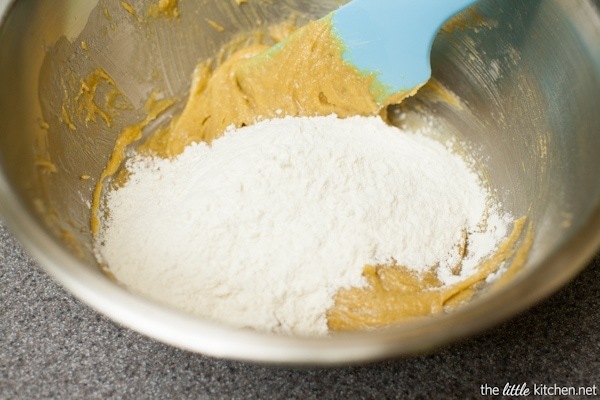 Mix the flour, baking soda, baking powder and salt with a rubber spatula in a small mixing bowl. In a medium sized mixing bowl, add sugars and butter and mix together thoroughly with the rubber spatula. Add peanut butter and mix again. Then, add the egg and make sure it’s mixed thoroughly. 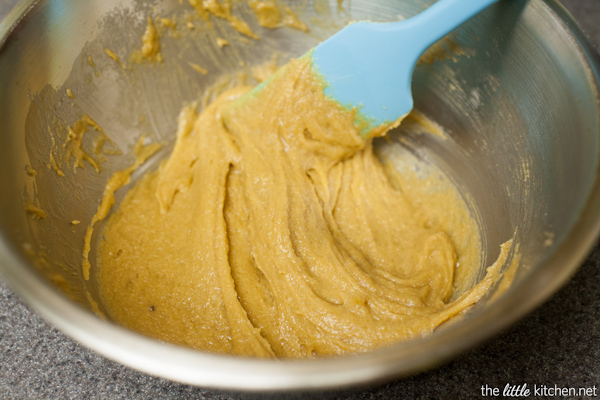 In two batches, add the dry ingredients to the peanut butter mixture and mix. Take the pie crust pan from the refrigerator. 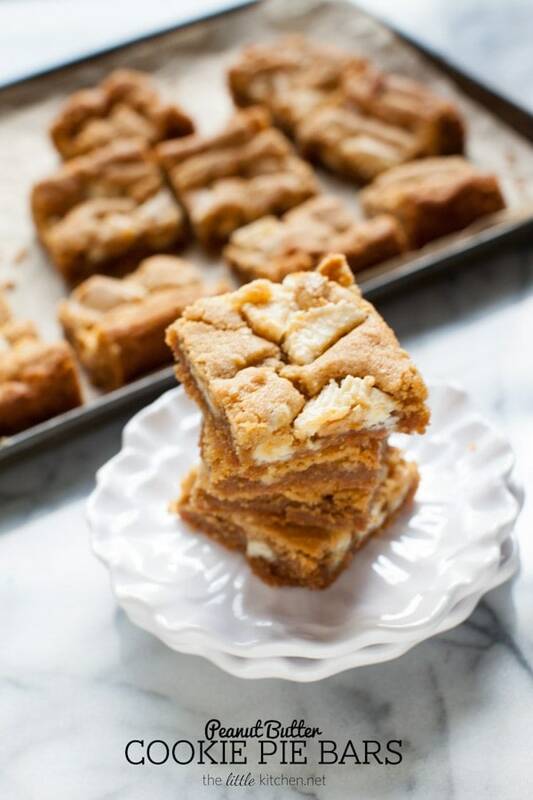 Place half of the cookie dough on the graham cracker crumb crust and spread evenly. Add half the butter cups and press in. Add the rest of the cookie dough and spread evenly (as best as possible). Then add the rest of the peanut butter cups and press them in. 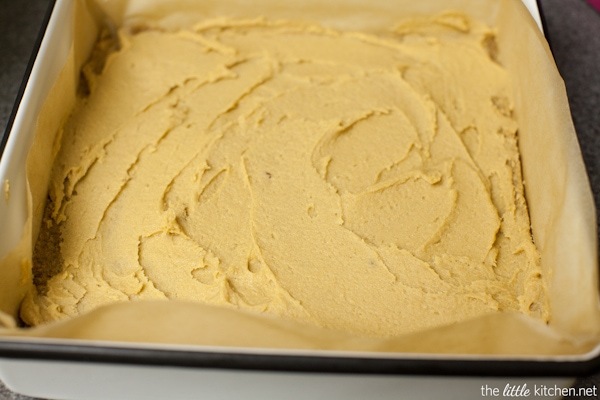 Place pan in the oven and bake at 350 degrees F for 22 to 24 minutes, until the cookie dough layer is fully baked. 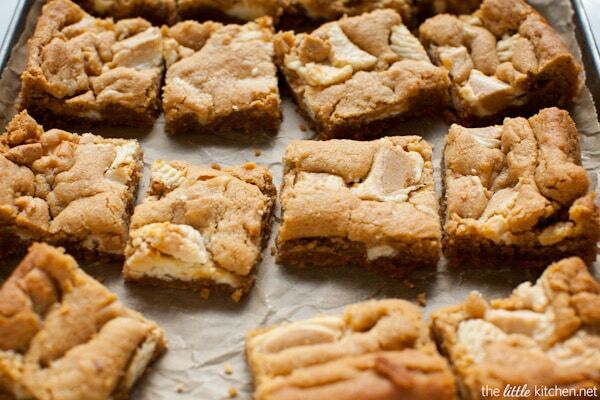 You don’t want to overbake or you won’t have soft pie bars. 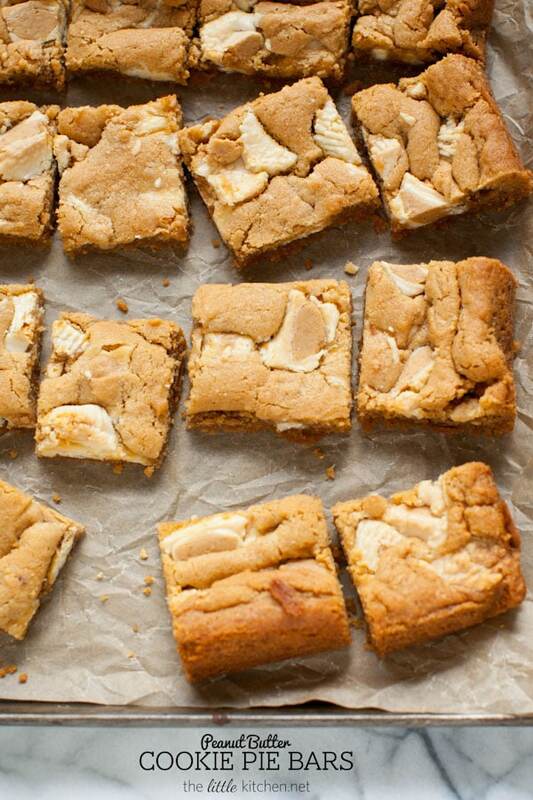 Allow to cool completely and then cut into bars. Save any leftovers in a seal container with a slice of bread to keep the bars soft.